The Olympics Games are a big deal in my house. Professional sports just don't interest me, and my lack of knowledge of team sports is almost embarrassing. The Olympics are different. I will watch any (or every, if possible) Olympic event, and the way I track medal standings is borderline obsessive. I know the Winter Olympics have a lackluster reputation in comparison to the Summer Olympics, but I like the Winter Games better. 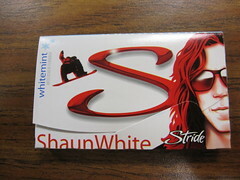 So, when Shaun White puts his name and face on a product, it totally works for me. The man is a snowboarding god. These samples were kindly sent to me for review by a PR representative, but just so you know, I would have bought this gum anyway. May I also add that the PR sample packaging was the cutest I've ever seen? The bold colors on the outer package were very eye catching and tied into the promotion nicely. The gum wrappers themselves were pretty, too! I loved the metallic white and blue motif. 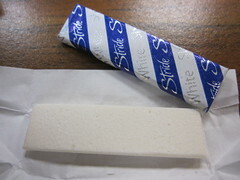 The gum itself was a cool and sweet mint. There were no hints of wintergreen or spearmint, just a nice, easy peppermint. I liked the sweetness, but some of my coworkers found it to be too sweet. The texture was great: soft but not mooshy, and it didn't seem to harden as I chewed. The cooling effect was pretty strong, and I found it to be a good after-meal breath freshener. Stride delivered on the long-lasting flavor, too. I was sick of chewing gum before the mint had completely worn off (probably about 10 to 15 minutes - gotta start timing these chews better). Whitemint is a safe flavor, but with the fun celebrity tie-in, it certainly left a good impression on me. Hmmm - this sounds yummy! I enjoy myself a sweet minty gum! I wish I was a coworker that could sample all your goodies! I wish you were my coworker, too! !